First we use the Quotation system for our proposal. We have a current cross-reference price catalog of over 1,000,000 computer related items that can be imported into the quote. We copy and paste product specifications from the internet and add headings, subtotals and formatting to produce the quotation along with leasing information automatically calculated. We use the pricing popup form to automatically margin our quote and add in special back-end rebates to certain products. After our customer has agreed to the quote, we open up the Point of Sale screen and import the entire quote. At that time, we can edit the order for additions and deletions. We then save and print this sales order. Our purchaser runs an automatic ordering process to create Purchase Orders based on the sales orders outstanding with no product in stock, as well as product that has fallen below our reorder points. The purchase orders are checked and sent via email to our suppliers. ETA's are updated which can be checked by the salesperson over the next few days/weeks upon customer request. When the product arrives, it is labeled with a bar coded label including a full description of the product, the product SKU, date received, salesperson that ordered it and the customer it belongs to. This makes it very easy to know who this product is intended for. At the same time, an automatic email is sent to the salesperson notifying them the product has arrived. When the customer arrives to pickup the goods (or they are shipped out), the salesperson simply converts the sales order to an invoice, adding serial number information and anything else that might be changed, and prints 2 copies of the invoice plus a packing slip if needed. 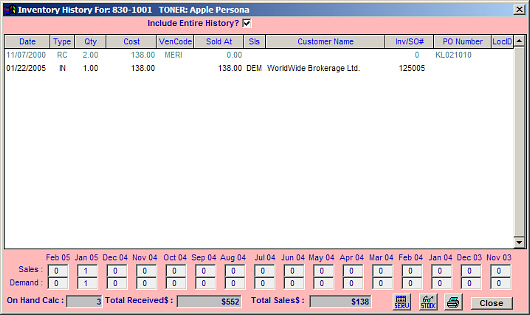 Both the item and the customer can be analyzed for historical sales information. We can determine how much of a product was received, what it was received at and what it was sold at... all within one popup screen available at a touch of a button on the main Point of Sale screen. The same method is used for customers - we access this information to find out what printer they have, how old their computer is (whether it's under warranty or not), what price they paid for consumables (in case they have a special deal) and total dollar volume over any period of time. Within one month of each new computer sale, we send out a Thank you letter that is triggered by a category designation added to the customer main contact. We also send out an email with our promotional items every 2 months to selected customers categorized to receive those emails. Emails to contacts can be made from within CISPro by right clicking on the email address itself. Customer account information is available at any time with one click. A screen detailing what is owing is displayed and clicking on any invoice number will bring up the original invoice in another window. This can then be PDF'd and attached to an email and sent to the customer within seconds. Our on-site technicians are booked through the Service Work Order system with date and time details. If the customer brings in the machine for service, we can quickly lookup their serialized items, add it to a work order and also view previous work orders for this same serial number in case there are multiple problems. Each technician enters their time and details for the work order, allowing us to track how efficient and profitable each technician is. Since the receiving information is in the system, it's a matter of typing a PO#, invoice or packing slip# into the Accounts Payable Entry and confirming the totals for each invoice. Invoice amounts that are different from what is received are listed on an exception report so that costing discrepancies can be followed up with the supplier. Distribution G/L Codes are posted automatically into the General Ledger at month end and with addition of normal Journal entries, we produce the financial statements for the bank. Our expensive product resides inside a secure caged in area. When product is taken out of this area, our staff sign it out using the Internal Transfers program. Each item is referred to a sales order, work order or special note. When we take a physical inventory of our stock and are missing product, we can use the inventory history along with this program to track the items and find out what happened from the person who removed it from the cage. In some cases we've found items were taken to be installed onsite, but never billed. This helps us keep a close watch on our inventory.